It may well be the food of love but is it the food of runners? Oooh, controversial Jones! For some time now I’ve been intending to blog about music and running and hey, here it is! If you’d asked me a year ago about running and listening to music, I’d have said, yes, definitely, I can’t run without it. I need the beat to keep me going and deter the boredom factor. I would have freely admitted that after a run I couldn’t have told you what I’d listened to but I would have been adamant that I couldn’t have done it without the music. Dr Costas Karageorghis, a renowned sports psychologist at Brunel University, would probably have agreed with me. He was involved with the Run to the Beat Half Marathon which proudly promoted itself as “London’s music half marathon”. The idea being that live music would be staged at numerous locations around the course to encourage the participants in their endeavours. Except the year I did it (also the first year of the event), it rained before, during and after and I think I remember passing only two bands on the course. Were the other bands prevented from appearing because of health and safety concerns, because they didn’t want to get their hair wet or was it just the fact they didn’t want to get up early on a Sunday morning, possibly after a gig the night before!? Who knows, but it was so wet on that run my MP3 player eventually drowned about half way around so I had limited musical accompaniment! In any event, until around this time last year I have always run with music but then along came parkrun. As I didn’t know the etiquette on my first run, I took my music with me but in the end I was so keen to know what was going on, it remained in my pocket! And it’s stayed there on a parkrun Saturday morning ever since. Then last September I took part in the BUPA Great Yorkshire Run in Sheffield and because I had a running buddy on that occasion, it would have seemed rude to stick my earphones in, especially as he had sacrificed his race for my benefit (see post Thank You Sheffield for more details) . The following month I ran the Givauden Ashford 10k – another very wet run and absol utely no point in risking the life of my iPod nano (yes, we’d progressed from an MP3 player courtesy of The Daily Telegraph). The next run was the Paddock Wood Half back at the end of March and this event was promoted as a “music free” run. 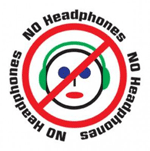 In fact if you were caught wearing headphones you would be excluded from the race. So on this occasion I had no choice. Bit daunting, 5k and 10k without music had been bearable. How would I cope during a half? Perfectly well, as it turned out. I even had a little chat with another runner on the way round. And now, when I go out for my “training” runs, I very rarely take any music with me (possibly partly due to a lack of pockets during the warmer weather!). I think I may have been partly influenced by a book I read following a reader review in Runner’s World – “Running with the Mind of Meditation” by Sakyong Mipham Rinpoche (I shall be blogging about this book at some point in the future). I would thoroughly recommend the book to anyone who runs. Unlike the reviewer, it has not made me run any faster (yet) but it has made me look at my runs differently (but more of that another day). Anyway, I digress! Not like me, I know! So what am I trying to say? I suppose if you think you can’t run without music, give it a go. You might be surprised and by the sounds of it, you might have to get used to it! 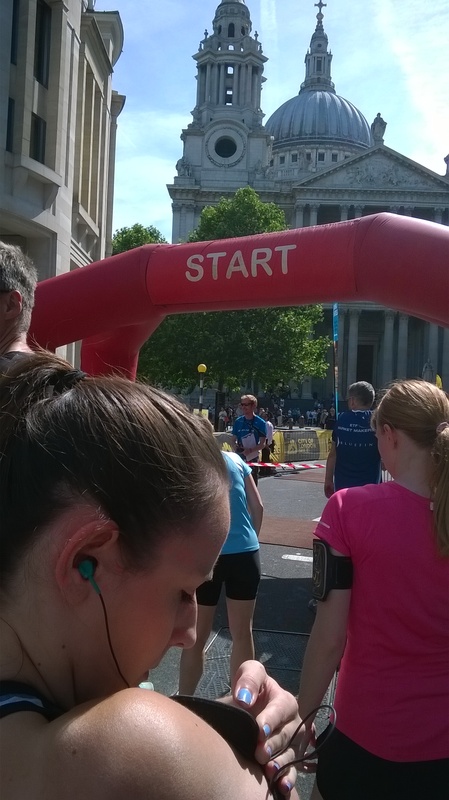 At last week’s Amba Hotels City of London Mile, while waiting for the start, we were advised that music was not allowed and I was surprised to hear them announce that all organised runs except parkrun are now music free zones – really? Has anyone else heard that? Another benefit I have personally discovered during “quiet” runs is you seem to get more respect from other runners/walkers/dog walkers/cyclists if you’re not wearing earphones. And, if you’re deaf to the world during an organised event, you’ll find you miss the humorous quips and friendly encouraging banter from other runners. Well I have to take back all my doubts; for a first attempt, that run was incredibly well organised and great fun to take part in. I shall definitely be back next year (legs permitting). Saturday found me wondering whether I’d perhaps under estimated the calibre of this run and whether I was going to be running with Sir Roger Bannister wannabe’s. I began to feel seriously under-prepared, I’ve never taken part in a run shorter than 5k and here I was attempting 1.6093k. The distance is not so much the issue, it’s the anticipated speed it’s likely to entail. After a typical runner’s pre race poor night’s sleep, I got up this morning to find my left foot had decided it didn’t want to take part. For some reason, every step was painful and it was the top of my foot which was causing problems, not my Achilles nor my plantar fascia! It did eventually wear off but I was a bit worried about what would happen when I started to run. Despite a few travel obstacles (weekend engineering works! ), I managed to get to London in plenty of time and enjoyed a leisurely stroll across London Bridge and down towards the start line. I thought it wise to now try out my left foot’s running capabilities (probably a bit late really, I should have done that before I left home) and I did a few casual jogs towards St Paul’s Cathedral in an attempt to warm up. There weren’t too many people around at that time so I didn’t feel too out of place. Once I got to the race village the number collection point was fairly easy to find and there were no queues! I collected my pack and some kind staff member even offered to hold my pack while I attached my number. 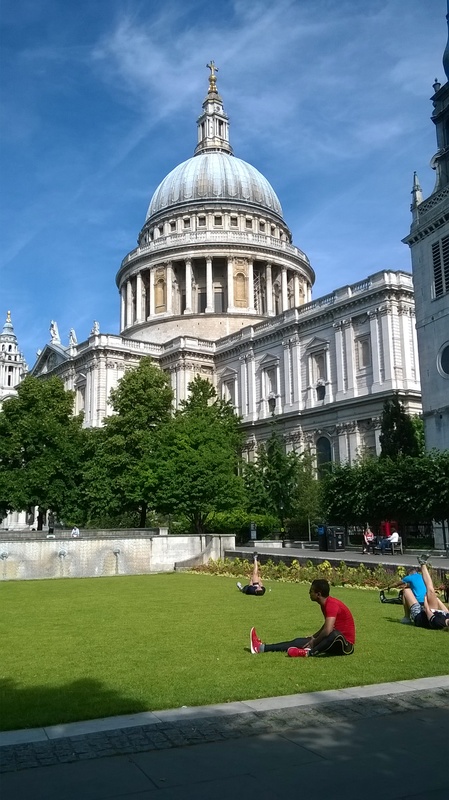 I then went and sat in a park by St Paul’s and attacked social media before heading back to the finish area. Announcements were made about the first wave being about to start and I calculated that I should be able to watch the first finishers come home before I headed out for my wave assembly area. The clock by the finish line and the announcer kept us informed of progress and I caught sight of runners in the distance. It was another minute before they came around the corner and headed for home so we all clapped and cheered as they crossed the line in a little over 4 minutes. My wave, the 7 to 10 minute group, were led from the assembly area to the start line just in front of St Paul’s and we gathered there in the morning sun to wait. We were given regular updates on how long until we would start and then all of a sudden the gun went and we were off. This is probably the closest I’ve ever been to the start line in a run (apart from parkrun). Usually the only sign that the run has started for me is that people start to move forward slowly and then gather pace as the starting gantry approaches. This time it was bang and go!! I put my best foot forward (yes, my right one! ), checked my watch had started and went for it. The pain should all be over in 10 minutes time, I thought! I have a mile marker for when I run from home so I tried to imagine I was following that route so I knew I would soon be at the finish. As a result I promptly missed a sightseeing tour of the Bank of England and the Guildhall amongst other icons. Although I had thought that this was probably the only time my habit of going off too fast was going to do me a favour, I quickly realised I’d gone off ridiculously fast, so I reined it in a bit. For some reason at no point in that run did I look at my watch to check my pace. So as we turned from King Street on to Cheapside and towards the finish, I caught sight of the finish line clock. S**t, it was saying 07:12. Apart from being amazed and thinking that can’t be right, it also put a bit of pressure on. I can finish this in under 07:30 so head down and go for it – even though there was a slight incline! I’d clocked that while watching the finish of the first wave. As I crossed the line I was fairly sure I’d done it but it wasn’t until later in the day that I discovered I’d done 07:27. I’m so glad I didn’t look at my watch, I think the pace and distance readings during the run would probably have told me the sensible thing would have been to slow down and I proved I didn’t need to. Before the run I was hoping that I’d be able to complete the mile in just under 9 minutes so that result has left me a very happy bunny! The run finish was just as well organised as the rest of the event, my chip was removed promptly and my goody bag handed over. It was even possible to leave the race area without having to go miles out of your way. Mind you, I did stop off at the Mizuno stand and buy a new pair of trainers, my third pair of Wave Inspire 9 and yet another colour combination (and 25% off)! Perhaps one of the reasons for the event’s success was because there were only around 2,000 people taking part and there were 13 different waves – including some mad fools who had just completed the inaugural Hackney Half and had come along to “cool down” by running another mile! So all in all, I have to say I was very impressed and I felt compelled to pass on my congratulations to the organisers. I shall now be incorporating some sprint work into my training so that this time next year I can beat my new PB. 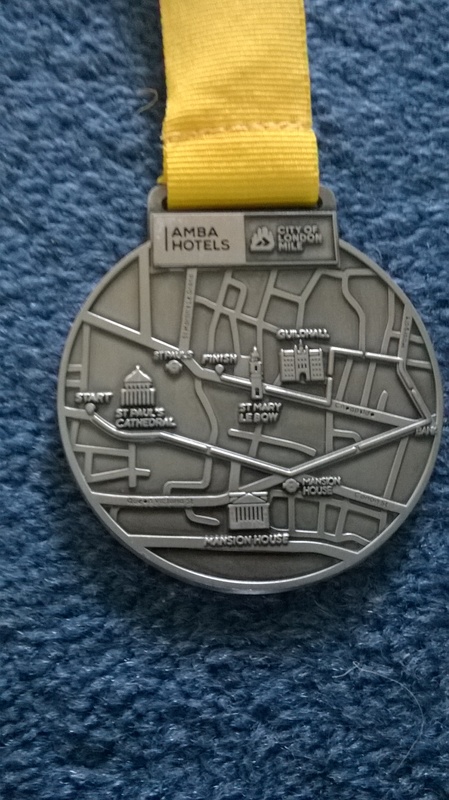 This Sunday sees my next run, the inaugural Amba Hotels City of London Mile. The clue here is the word inaugural, this means it has the potential for chaos. I don’t wish to demean all the hard work of the organisers and I hope I’m wrong but past experience (AKA the inaugural Run to the Beat Half Marathon) tells me this is a possibility. Time will tell. This sense of foreboding is probably exacerbated by the fact that race packs could be collected from the Run Fast store in Leadenhall Street on the Friday before the run (ie, today). All very well if you work in the City and hadn’t taken Friday off to recover from your post England match celebrations/commiserations – delete as appropriate. Yes, I know we now know the score but the options still apply depending on whether you’re a football fan or not! Anyway, back to the run. The only other option is to collect your race pack on the morning of the run. I have visions of runners (me included) wandering lemming like around the race village trying to attach their numbers and chips and drop off baggage all before collecting in their wave group and heading off to the starting pen. To be fair, when this run was first announced you had to pay to enter but several months ago it was announced that the run would now be free to make it inclusive for everyone. As a result, keen people like me who had already paid have had their money either refunded or donated to the official charities. I have donated my fee towards my entrance fee for next year’s BUPA London 10000 – now there’s a run you know will go like clockwork. Apart from the fact that this run is now a firm regular in my running calendar, next year offers the possibility of a different route as the usual route may be disrupted by the Cycle Super highway construction due to take place during 2015. Because the run starts in the heart of the City, my travel arrangements mean I’m going to have to alight the train at London Bridge and walk to the start. This probably means I’ll be walking further than the run itself! But at least my muscles should be warmed up. I will report back on whether chaos ensued or whether I was proved wrong, and any other exciting incidents after the weekend. 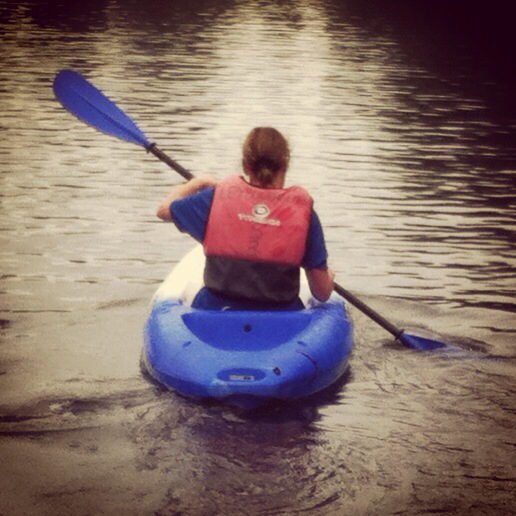 Messing About on the River (or to be more precise, Lake)! 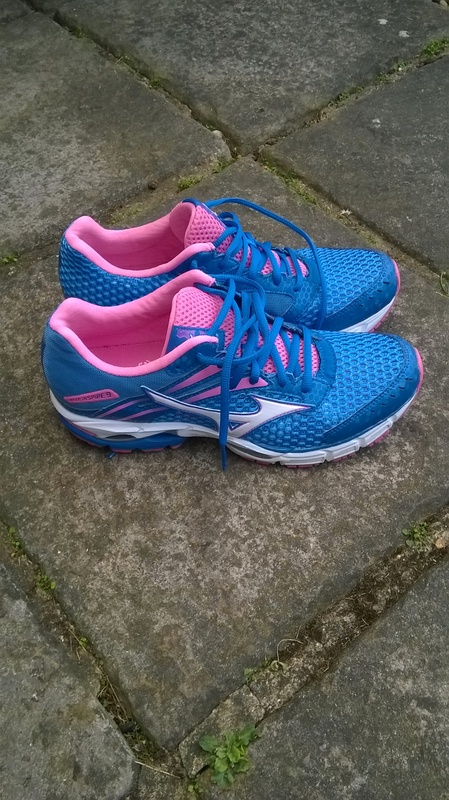 I think I might have to change the title of my blog, perhaps to “Ramblings of a Menopausal Runner Who’s Suddenly Decided to Try as Many Sporting Activities as She Can in the Shortest Possible Timeframe” – catchy, or not?! This week – kayaking! I’ve never tried this before but I have to say it was fun even if I did end up with a blister on my thumb. And I didn’t even fall in. 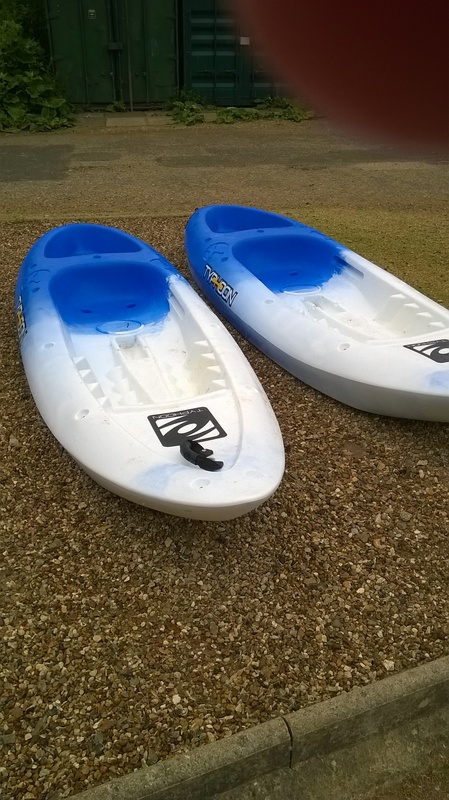 I went around and around in circles for a while until I mastered the necessary steering skills but after that it was a case of paddling hell for leather as Alex and I made our way around the perimeter of Leybourne Lakes. It is the intention one day to swim around the perimeter but yesterday we settled for a more leisurely cruise in an open kayak. There was the obvious humming of the Hawaii Five-O theme tune at one point as we sped across the water trying to mow down any swimmers who got in our way, we even attempted to race one swimmer (he was completely oblivious to the fact) and we won! At the furthest point away from the landing stage and the watersports centre, we discovered a gap in the trees and a passage of water that takes you into another lake. There weren’t any “do not enter” signs so we casually glided through the gap into new territory. Not much happening here, just a few swans seeking shelter from the swimmers and model boat enthusiasts, and us! As we continued circling the perimeter of this smaller lake, I suddenly noticed a man appear amongst the trees on the bank. He didn’t say anything, he just stood there, looking …. I think we both clocked him at the same time but decided (a) there was safety in numbers, (b) we were in the middle of a lake and (c) he didn’t appear to have a kayak secreted about his person. So we carried on paddling and when we turned to come back, he’d gone. Phew! We spent a few more minutes pootling around this “secret” lake and then decided to head for home, mainly because we didn’t want to go past our hour and incur extra costs! Just as we passed through the gap there he was again, standing on the water’s edge, looking …. This was all getting a bit Blair Witch Project so we put our foot down (or whatever the equivalent is in kayaking) and sped off towards safety. During our return, Alex advised me that she would quite like to have a go at white water rafting. I said “no way” – seem to remember I said that when she first asked me about open water swimming, oh well! I was also fairly confident that we wouldn’t find anywhere to do that within reasonable travelling distance until I remembered Lee Valley (http://www.visitleevalley.org.uk/go/whitewater/) and the Olympic legacy. Please, no one tell Alex! I would thoroughly recommend kayaking to anyone wanting to tone up their arms, strengthen their core or desiring a wet bum! It’s a fun way to exercise, even when it’s raining! Could I look any more awkward!? 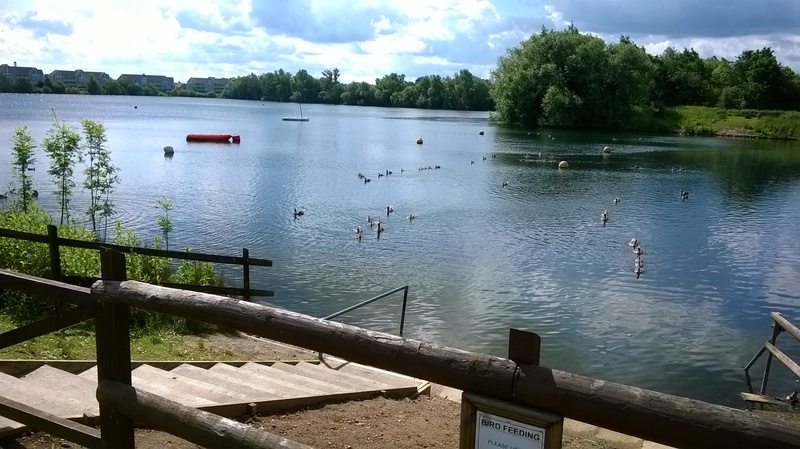 Our next intrepid adventure is acquiring another open water swimming licence, this time to be used at Holborough Lakes in Snodland. This lake is a flooded chalk quarry complete with terrapins, adders and other assorted marine life. 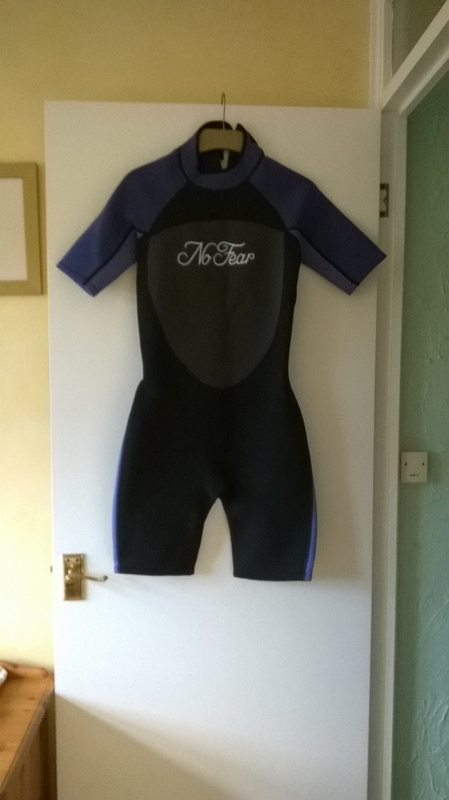 We have an assessment booked for tomorrow afternoon with Nemes Diving & Watersports Academy (http://www.nda-scuba.com/) and I have even invested in a new item of clothing especially for the event. In the not too distant future we plan to have a go at tennis. It must be a few decades since I personally tried that one so with my eye/hand/ball co-ordination, there could be an awful lot of running around to pick up said ball! Also I think with the start of Wimbledon next week we may have to wait a few weeks for the sudden enthusiasm for tennis to wane! Watch this space! So the running is carrying on as normal, nothing startling to report but how’s the open water swimming going Jones? Dare I say it, swimmingly!!! So suitably attired, we set out for our “swim”. The first 750m lap took us about 45 minutes – bit too much chatting going on I think! And perhaps because of the warm weather there were a lot of other swimmers around. I have to be honest, I felt a bit like the last one at the race again and we need to discover what the etiquette is when you suddenly realise there’s a top notch swimmer heading towards you like a seal. Is it your responsibility to get out of the way – quick? Not easy if you’re not a strong swimmer. Or is it the ace’s responsibility to take action to avoid a mid-lake collision? Having been shamed by our 45 minute lap, we decided to “go for it” second time around – we managed to knock off 15 minutes and there was very little chatter that time around. And although I did manage to get a little braver at putting my head under the water, my technique was all wrong. In fact, I’m a bit like an upside down swan – my arms glide serenely under the surface but on top there’s a hell of a lot of thrashing legs – okay maybe only two thrashing legs but it probably looks like a lot more. At least there’s no danger of those on land wondering where I am! I think this poor technique might be partly due to me trying to go as far as possible before needing to come back up for air. Anyway, after our two 750m laps we decided to finish off our session with a leisurely swim out to the catamaran and back, approximately 200m. So in total we managed just over a mile in an hour and a half – if we were running, that would have taken around 10 minutes – even with some chatting!!! There’s a long way to go before I even consider a duathlon. As we emerged from the water through a group of basking seals – I mean swimmers – I couldn’t help but earwig on their discussions about their recent triathlons. Why, when asked, do we always seem to prefix our achievements with “I was ill the week before”, or “my hamstring/knee/quads/back/etc has been playing up”. Why can’t we just be proud of our achievements and appreciate the fact we could take part at all? Here I am going back to my “seduction of inadequacies” post https://ramblingsofamenopausalrunner.wordpress.com/2014/04/15/mind-games/. Mind you, I’m guilty of doing it too so I shouldn’t criticise, I just found it amusing. Once the wetsuit had been shed (much easier with a shortie, I managed this without any danger of falling over), we sat in the sun for a while and watched the fluffy ducklings preening themselves at our feet. Rather predictably discussion turned to feeding orange slices to them, picking cherries and the merits of crispy Chinese food. The ducklings though seemed rather unperturbed! Mummy and Daddy duck need to give them a few life lessons! So next week I’m told the plan is to try out the kayaks. And lifejackets will be worn! They’ve got to be easier than wetsuits, surely!? This past week has demonstrated a clear lack of enthusiasm for running, I’ve managed only two! I could say I was recovering from the previous Sunday’s run but I would be telling porkies! So in absence of any other topic to ramble about, I’ve copied and pasted below the run report “wot I wrote” for Shorne Woods parkrun last weekend. As many of you know Jonathan had opted to walk from London to Brighton this Saturday and he left me in charge of the run report – sorry!!! So the midweek weather update wasn’t far wrong – “the current weather forecast for this parkrunday is 12-13oC, showers, sunny intervals, showers, a gentle 8mph breeze and maybe some more showers!” Not sure about the temperature or the wind speed, I don’t actually remember seeing a sunny interval but I certainly remember the showers, especially the one towards the end! Hey ho, a drop of rain never hurt anyone although judging by the state of some of the runners, it may have resulted in a few muddy showers/baths! You may have noticed this week’s newsletter carried an item on bringing dogs to parkrun and it almost seemed like this had acted as a reminder to many parkrunner dog owners. As the other volunteers and I gathered around the start area to await the start assembly, the appearance of a more than normal number of dogs suggested that this was definitely turning into a barkrun. This must have been a record canine attendance for Shorne Woods, surely? They even brought along their own supporters who were noisily barking encouragement from the play area as their pals bounded passed. Anyway, up until now my volunteering has been as acting as a marshal and as no one’s knowingly got lost on my watch, this week I’d been entrusted with the finish tokens. The responsibility of that had been giving me nightmares all week! Suppose I dropped them? I had visions of me scrabbling around the finish funnel trying to retrieve the tokens and then put them all in the right order before the first runner appeared on the horizon. But I needn’t have worried, with consistent parkrun efficiency there’s a very simple process to minimise the ramifications of such an event happening – strategically placed knots! Cold and wet fingers certainly made this disaster a distinct possibility but I’m glad to say all 88 tokens were distributed promptly and in numerical order. Apologies if you felt I was rather zealous in my role and that you needed to catch your breath first before I foisted a token in your direction. I was just very anxious to make sure everyone got the right token! This particular role had the added advantage of meaning I actually saw the first runners crossing the finish line and let’s be honest, that’s the only time I’m likely to be present at that moment! So if you’ve been thinking about volunteering, give it a go, you won’t regret it. And the enjoyment of taking part without having to actually run does come with a sense of relief on a Saturday morning – well it does to my legs anyway! Hopefully Jonathan has returned safely from Brighton and assuming his feet have recovered, normal run report service will be resumed next week. As there was initially a bit of a shortage of volunteers for yesterday’s parkrun, I put myself forward to help out again and amazingly once more I was put in charge of the finish tokens! This time there were 148 runners and some of them came through the finish line in big groups which meant I panicked and required help with the strategically placed knots! Mind you, since I tied those same knots after last week’s run, I have only myself to blame! Next Saturday I will, however, be running – barring any injuries sustained during what will hopefully be a better running week.